Quite possibly, the most controversial topic in the world of wine is the use of the term terroir. Since the Benedictine and Cistercian monks studied and defined the concept of terroir in Burgundy and Germany, the interesting question of “what terroir is” opens a long discussion between wine enthusiasts. Where does statement such as, ‘This wine taste of the terroir’ or ‘it has the stamp of the terroir on it’ come from? Terroir is an umbrella term that combines the set of different factors affecting wine: the influence of climate, soil, topography, humidity, rainfall, sunshine, soil chemicals and human intervention in the cultivation of the vine. Therefore, terroir could be understood as the “fingerprint” of each wine, a feature that gives a certificate of origin to each produce and define its origin. Etymologically the word is of French origin and refers to something related to the earth. However, there is no such thing as a literal translation of anything French. By tracking the origin of terroir over time, the word comes from the Latin word “terra”, meaning land. However, this does not shed light upon its meaning because very often the term is assimilated with the geological composition of the vineyards, which is no longer the case today. Initially the terroir was associated with the earthly fragrances that some wines from classical regions such as Bordeaux, France contained. Generally today, there is still a traditional, somewhat romantic perception of the terroir, associating it to specific vineyards of the Western Mediterranean. The term ends up being a word that all wine-lovers use and no one really knows what it means. The trend, however, today in all countries is to recognize the importance of the site of a vineyard and more specifically the combination of different factors such as the location, the variety and the type of the wine produced. Why is this? Experts agree that terroir in general, is what adds the characteristic taste and flavor imparted to the wine by the environment in which it is produced. Mountain vineyards offer a different climatic rhythm and thus, produce a greater intensity of flavors and aromas. As elevation increases, sunlight becomes more concentrated causing grapes to develop deeper pigments. They get more early sun because they are above the fog line, thus forcing grapes to mature and ripen slowly. In the afternoon, the heat from the valley floor begins to drift up the hillsides. The grapes absorb more sun, then, close down at night, halting photosynthesis, sugar formation and acidity, locking in their structure and backbone while allowing them to ripen perfectly. The mountains are more exposed to prevailing winds, giving more stress to the vines. The variation from warm to cool causes the vines to struggle, developing the acidity needed to produce such intense aromas, flavors, colors and tannins. You get much more depth, more notes, more balance, more structure and complexity from these climatic rhythms. There is intensity to the fruit because they mature more slowly and age much more gracefully. Due to this, there is depth and structure to the wines that you actually taste in these mountain grapes. In the vineyards of the Domaine, “Oenou Yi”, which exploit the unique ‘terroir’ of Omodos, the most noble local and international varieties thrive. The clean, thin, cool mountain air which steadies the day’s temperatures creates warmer days with full sun and cool nights. 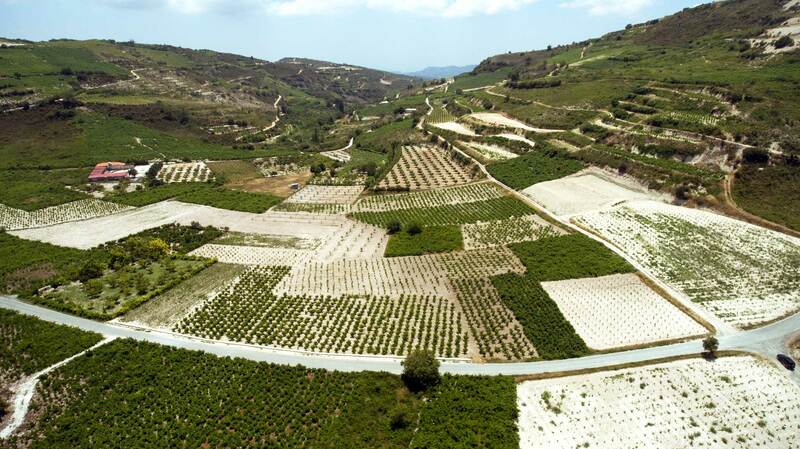 The distinctive and diverse topography and geology of the Omodos vineyard and wine landscapes, characterized by limestone, rocky mountains and prominent ranges of hills, are outstanding natural components. As a result of this topography and geology, even more diverse soil types occur, as well very diverse microclimates due to variation in altitude, sunlight interception and exposure to Mediterranean sun.